I HAD AN ESPECIALLY STRESSFUL WEEKEND OF WORK IN THE BEGINNING OF DECEMBER, BUT WE MADE SURE TO SET ASIDE SOME TIME TO GO PICK OUT OUR CHRISTMAS TREE. 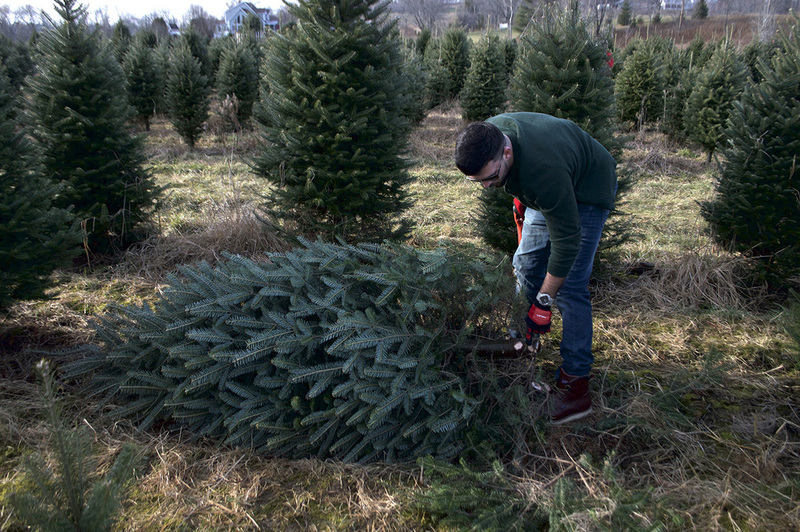 WE LOOKED FORWARD TO CHOPPING DOWN OUR OWN; IT SEEMED ONLY NATURAL NOW THAT WE LIVE IN VERMONT. SO WE HEADED TO WHITE'S TREE FARM IN ESSEX, VT TO FIND THE PERFECT ONE. THERE WAS ONLY ONE THING WRONG WITH THIS PICTURE. IT WAS UNCHARACTERISTICALLY WARM, RESULTING IN ABSOLUTELY ZERO SNOW. THE SNOW COVERED, BUNDLED UP, CHRISTMAS-VACATION-LIKE TRECK WE'D EXPECTED COULD NOT BE MORE OPPOSITE OF WHAT WE ACTUALLY EXPERIENCED. I WANTED THE STRUGGLE AND I WANTED THE SNOW, LOTS OF IT AND THERE WAS NONE. DESPITE THIS, WE STILL HAD A GREAT DAY. BECAUSE IN REALITY, IT WAS A LOT EASIER TO PICK OUT OUR TREE (AND FOR DAVE TO CUT IT DOWN). WE SIPPED ON PEPPERMINT HOT COCOA AND PERUSED THE SHELVES FILLED WITH CHRISTMAS TRINKETS WHILE ON LINE. WE GOT HOME, PUT ON SOME HOLIDAY MUSIC AND DECORATED OUR TREE. IT WASN'T EXACTLY HOW WE'D IMAGINED THE DAY TO GO, BUT IT TURNED OUT TO BE EXACTLY WHAT I NEEDED. FUN FACT: WE COUNTED 26 PEOPLE WITH TREES ON THE ROOFS OF THEIR CAR ON OUR WAY TO WHITE'S TREE FARM.